A new utility has features for managing copied items found elsewhere combined with unique additions that help in a world of text. In February 2015, Joe Kissell wrote a thorough round-up of clipboard-managing utilities, some of which have a lot of non-scrapbook functions, too. Pastebot 2 has the best features shared among those, and adds more by offering customizable filters and a clipboard “accumulator” that I’ll explain later in this review. 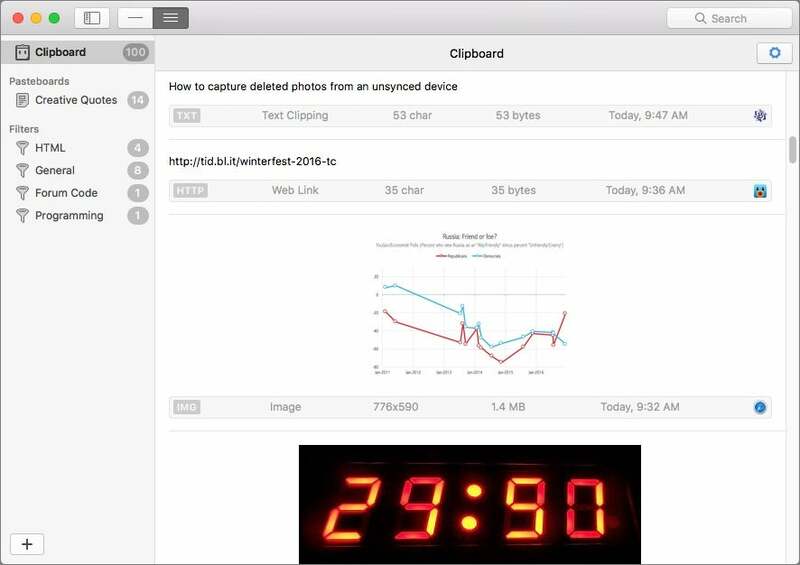 Once installed, Pastebot captures everything that you copy or cut to the system clipboard. You can access this deep scrapbook from either a system menubar item or the app, where the clippings appear in reverse chronological order. 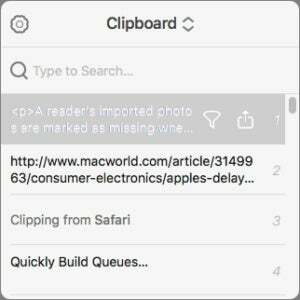 Each clipping is marked by type—text, http, image, RTF, and more—and shown in either a one-line or thumbnail preview. You can opt to show the full contents of clippings, too, as a view option, and you can use a Quick Look-style spacebar press to show a larger or full preview. The clippings also record the source, length, date, and application of origin. The Pastebot app previews everything you’ve copied and captured. You can choose how deep the backlist goes, from 50 to 500 entries. And you can opt to exclude extremely large items by specifying a threshold in megabytes; the default is 25. That’s useful if you’re copying large images or datasets within a program. Pastebot also includes a Blacklist tab in Preferences so you can exclude the clipboard from apps you specify, like those that manage passwords (1Password, LastPass, Keychain, and so forth), and those for which you’ll never want to capture the clipboard, which can include image and video-editing programs. 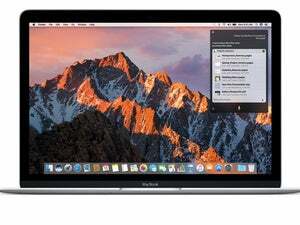 With an iCloud account, you can sync items across all your Macs. An iOS version that interoperates with the macOS Pastebot isn’t out yet. But Pastebot for macOS works just fine with the Universal Clipboard available in Sierra and iOS 10 to let you sync something you copy from Pastebot to an iPad or iPhone. I’ve already found it handy just in testing to recover lost pasted items, which happens to me when I’m managing multiple windows and projects at once. You know the problem: you cut (not copy) something from a document intending to paste it elsewhere in a moment, but then a distraction emerges, such as another problem in the same text. You copy and paste there—and realize you’ve lost your previous clipboard. You can furiously press Undo if in an app with many layers, but then you’ve lost your new changes. Pastebot lets you walk back in time for accidents, but you can also use it this way intentionally. It has a full-text search feature if you don’t want to scroll through and scan for the entry you need. The Quick Paste Menu lets you paste recent items by number. Clippings in Pastebot can—of course—be copied in a variety of ways from the main app window and the Quick Paste Menu, invoked from the system menubar or with an optional keystroke. In the main app, you can double click or select and press the right arrow to copy. 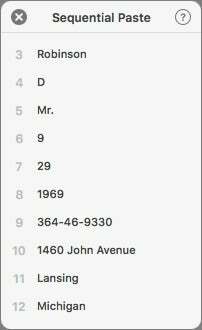 With the Quick Paste Menu, however, the last ten clippings are assigned a number in ascending order from 1 through 9 and ending with 0 as the 10th. Press the appropriate number key, and the item is copied, the window dismissed, and the item is pasted at the current foreground app’s insertion point or accepted as a pasted item. I expect most people will spend most of their using the Quick Paste Menu, the behavior of which can be customized, too. Instead of appearing in a fixed location, you can choose to have it always pop up behind the current mouse pointer location. You can also set it so that you hold down the invocation keys, set to Command-Shift-V by default, and select an item that’s automatically pasted when you release those keys. Tapbots has built these features out in an easy-to-use and generally explicable manner, though it provides a brief and well-written online manual as well, a nice plus in an era of apps with no documentation at all. 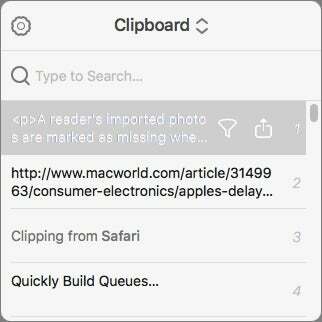 However, Pastebot does well when you look beyond these basics that are shared among most clipping utilities. Filters transform text, including into HTML, and let you see a preview of the results before pasting. 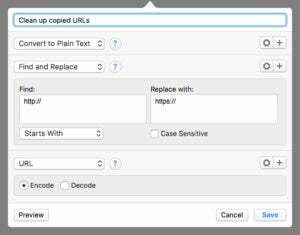 While many competitors offer text filters, Pastebot not only has a number of prefabricated conversions—such as decoding URLs and converting rich text to plain text—you can create new, multi-step filters that would otherwise require using something like text factories in BBEdit or a set of macros in something like Keyboard Maestro. For example, if I copy a URL, I might want to clean it up, change the http:// to https:// (to ensure a secure link), and then encode the URL to make sure none of the characters I copied have special formatting that won’t work as text. That’s three simple steps in a filter, all available from popup menus. Pastebot also includes some helpful HTML formatting, such as creating a list. 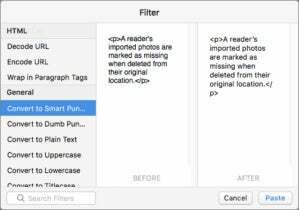 Filters can be invoked by right-clicking an item in the Pastebot app, and by clicking a Filter icon in the Quick Paste Menu, from which you can select the filter. 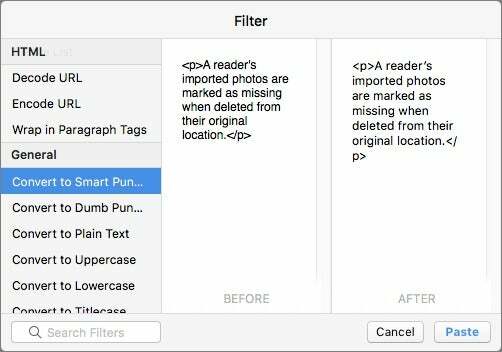 Even better, filters can have an assigned keystroke, letting you invoke a filter against the text currently held in the system clipboard. And, to top it off, you can add a keystroke to enable a global feature that invokes the last filter you used to apply against the current clipboard contents. Creating a filter is straightforward, and can have multiple steps. The Sequential Paste queue requires a little explanation before explaining how it works. It’s an answer to the situation you may encounter when you have a set of data in one place you need to copy to another, which comes up for me all the time with Web forms. Instead of “switch to tab, copy, switch back to tab, find the field, paste,” you can copy everything as separate items to the queue. The queue can hold up to 25 items. Then you can paste items from the queue into a new place. For instance, might want to copy the name, mailing address, phone number, and email address of a contact as separate items from an email, Web page, or your contacts list, because you have to enter them as individual items on another form. The queue can’t be edited or the order of items pasted out of it changed. I hope that’s improved in a future release. The Sequential Paste queue makes it easy to copy many items from one place and then paste them in order somewhere else, as in a form. If you find yourself wishing you didn’t have just a single level of clipboard depth, or yearn for the sweet return of Scrapbook, Pastebot 2 provides that in an efficient way with lots of options for customizing to work best with you. 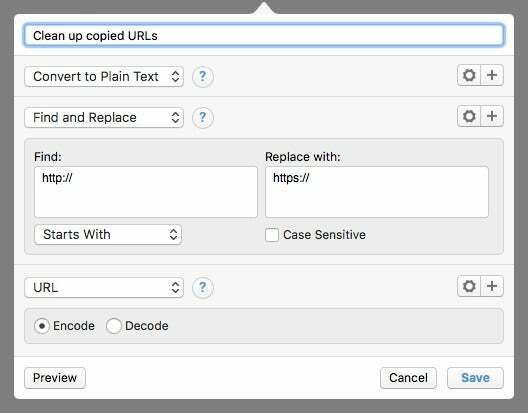 The combination of being able to assign keystrokes and change basic behavior while retaining a deep backlist of clippings means you can retain the history of what you’ve cut and copied and find and apply it easily. While Pastebot’s basic features are well implemented and work as expected, it shines in the extras, especially the robust but not overwhelming filter editor. Transforming text, HTML, and URLs, and removing the “richness” from rich text remain remarkably common tasks for many people, judging by the support email I receive from readers.